In his over 25-year career at the world’s most innovative organization – The Walt Disney Company – keynote speaker Duncan Wardle learned many important things about building a profitable business and winning creative culture. The most important? If you want to be different, you have to think different. As one of the most impactful creativity speakers, Duncan leans on his experiences as the Head of Innovation & Creativity at Disney to take audiences on a journey. Throughout Think Different, they’ll be given a unique set of Innovation Tools and Techniques – the same ones Duncan used with teams inside the Disney organization. These include the breakthrough “What If” creative thinking tool, made famous by Walt Disney himself, who used it to pivot his company from simply an animation house to an entertainment and theme park pioneer. After this immersive crash course from the acclaimed creativity keynote speaker, your organization’s ability to mine for creativity and innovation will be drastically improved. In the end, your audience will leave with an actionable set of steps they can take to immediately start reshaping your company’s culture, creating a space where innovation thrives, and teams are encouraged and rewarded when they think different. Innovation is not something that happens by chance. It’s the result of building an environment in which it can thrive. Duncan Wardle knows a thing or two about fostering an environment of innovation. During his time as the Head of Innovation for a company known for redefining pretty much every industry they touch – The Walt Disney Company – Duncan’s decades of success weren’t merely a matter of luck or chance. No, his results were a direct reflection of his ability to create an innovative culture, and ensure that everyone on his teams were put in a position to let their inner creativity run wild. In his Embedding Innovation Into Everyone’s DNA keynote, Duncan will share the exact steps and strategies used to create such an environment. Your team will learn how to create safe spaces for taking creative risks, ensure everyone on your team is empowered and thinking like an entrepreneur, and transition from the ideation stage into action. He’ll also share a creative problem-solving tool called “What Else,” which will prime your organization to discover innovative ideas each and every time you set out to tackle a challenge. In the end, your team will walk away from this keynote with a fresh outlook on their day to day tasks, and be ready to approach them with new levels of creative thinking, allowing innovation to flourish. The best brands in the world don’t thrive simply because of their great product or service. They thrive because of an unrelenting passion and focus on customer experience. Throughout Customer Experience Magic, creativity keynote speaker Duncan Wardle will show your audience what can happen when your organization transitions from a product-centric focus to a customer-centric one, and the steps you’ll need to take to get there. He’ll share a famous real-world example from his time as the Head of Innovation and Creativity at The Walt Disney Company, where they found themselves facing challenges brought on not by their direct competitors, but by retail behemoth Amazon, whose lightning-fast fulfillment and delivery systems drastically changed how long consumers were willing to wait to be served. As Duncan walks your audience through this example, he’ll share the exact steps they took to turn this problem into a massive opportunity, and how they used it to reshape the way Disney serves its theme park guests, creating a whole new echelon in customer experience. A new level of experience that’s frequently deemed to be “magic” by their guests. By the end of this interactive presentation, your audience will have developed a whole new understanding of customer experience, and will be able to reframe all the challenges facing your organization, finding those unique opportunities to create some customer experience magic. Duncan Wardle is the former VP of Innovation & Creativity for Disney, where he founded the Creative Catalyst team. He developed a design thinking toolkit enabling both individuals and teams to increase their capacity to innovate. Duncan not only inspires companies to be more creative, he gives them the tools to rediscover their inner geniuses. He marries strategic thinking with creative ideation to deliver game-changing and measurable results. The former Vice President of Innovation & Creativity at The Walt Disney Company, Duncan Wardle spent his 25-year career at Disney developing some of their most innovative ideas and strategies. Ideas that would forever change the way the company expands its impact, trains its employees, and solves problems creatively. What sort of ideas? How about sending a beloved Pixar character into outer space? When tasked with developing a creative public relations campaign to launch Walt Disney World’s newest attraction, Toy Story Mania, Duncan made a deal to send the one and only Buzz Lightyear up on NASA’s Space Shuttle Discovery, where he took part in the live broadcasts Astronauts beamed back to earth. It was the ultimate in creative cross-promotion, and forever gave Duncan bragging rights, having launched a PR campaign that was literally out of this world! Back on Earth, Duncan and his team were tasked with leading the Walt Disney creative process for LucasFilms, Pixar, Marvel, Disney Imagineering, Disney Parks and ESPN. Realizing that innovation and creativity were not inherent traits, but something that could be taught and learned, Duncan founded the Creative Catalyst Team. This team was used to teach employees across all the Disney properties how to develop their own “thinking toolkit,” which would enable them to strategically and repeatedly create moments of innovation within their business units. The program was a massive success, and during Duncan’s tenure, the group trained over 3,000 professional and executive Disney cast members. Participants walked away from Duncan’s program with the ability to think more audaciously when solving challenges and create innovative new storylines, products and services throughout the entire Disney universe. 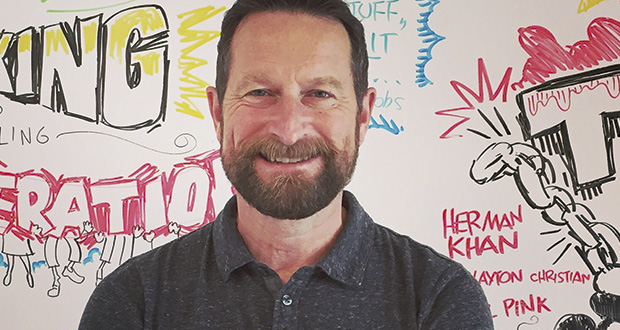 While Duncan loved the challenge of running the creativity and innovation teams at the world’s most creative company, he understood that his ability to successfully teach others to develop an innovation and ideation toolkit was something that could have a massive impact for people and organizations across the globe. And so, he left to launch his creative consulting company id8, which has quickly become one of the top innovation consulting firms in the world, and in the process, has allowed Duncan to share his creative consultant services and innovation workshops to thousands of employees and executives at companies such as Ford, McKinsey, Coca-Cola, NBA, Apple, Johnson & Johnson and Forbes. With an infectious energy and playful collaboration, Duncan pushes executives and their teams to overcome preconceived ideas, act more audaciously, and develop their own innovation “light switch”, which is a method to activate their creative brain and access the ideas that turn ordinary companies into industry leaders. “Duncan was an inspiring part of TEDx. His knowledge and experience are matched by his enthusiasm for delighting the audience with his wit and charm. I look forward to working with Duncan again- learning & exploring, in-depth, through his design workshops!"